Brookfield Property Partners (BPY) is a leading global commercial property company. The commercial property operations include office, retail, multi-family and industrial assets with interests in over 300 office and retail properties of more than 250 million square feet; approximately 15,600 multi-family units; 29 million square feet of industrial space, and; an 18 million square foot office development pipeline. Brookfield Property Partners is the third major entity spun off and last major step in Brookfield Asset Management’s (BAM’s) transformation to a global asset manager. BPY was launched [Source] April 15, 2013 trading on the New York Stock Exchange (NYSE) and the Toronto Stock Exchange (TSX) under the symbols BPY and BPY.UN respectively. It is their largest investment platform with $103 billion of property assets under management, 300 million square feet of commercial space globally, and one of the world’s largest owners, operators and investors in property. Brookfield Asset Management and its predecessor companies built the property platform through acquisitions over many decades with activities in various facets of the real estate business going back to the 1920s. A predecessor company built the Montreal Forum in 1924 to provide facilities for Montreal Canadians of the National Hockey League. In 1976 Brookfield acquired a controlling interest in one of Canada’s largest public real estate companies and steady escalation in commercial property values over the next ten years provided the capital base to expand. Taking advantage of falling real estate values during the recession in the early 1990s and again in 2003 the company made its first investments outside of North America in the United Kingdom. Brookfield further expanded outside of North America in 2007 making property investments in Australia. 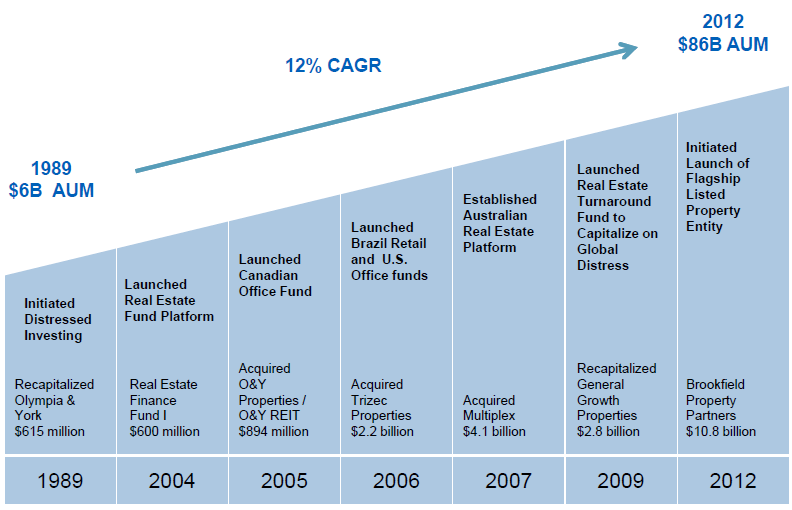 Adhering to its characteristic disciplined and value oriented approach through market cycles; over $19 billion of equity capital was invested since 1987 and over $100 billion of property assets is now under management. These assets either directly owned or through investment vehicles now form the core Brookfield Property Partners. Brookfield Property although launched this week, has a 23 year history with Brookfield Asset Management of providing a compounded 15.4%/year total return through some of the most tumultuous markets in generations. Brookfield Property appears well positioned to continue delivering strong returns to investors seeking global exposure to commercial real estate. Ironically, recessions, economic crisis, and slow economic recoveries present a favorable investing climate for BPY. They use a strong balance sheet and financial stability to apply a disciplined and value oriented approach. Although always active, It is often in unfavorable economic environments, where they capture once in a generation opportunities for shareholders. The financial follies creating these economic down turns seem to be in a continuous long supply around the world. The company appears well positioned as a buffer to these events and will likely be an outstanding income and growth investment. A reasonable entry price is $28/unit (or below) and at the current price of about $22.00/unit yields a 30% margin of safety. While we wait for the capital appreciation we collect an estimated 4.5% per year distribution. 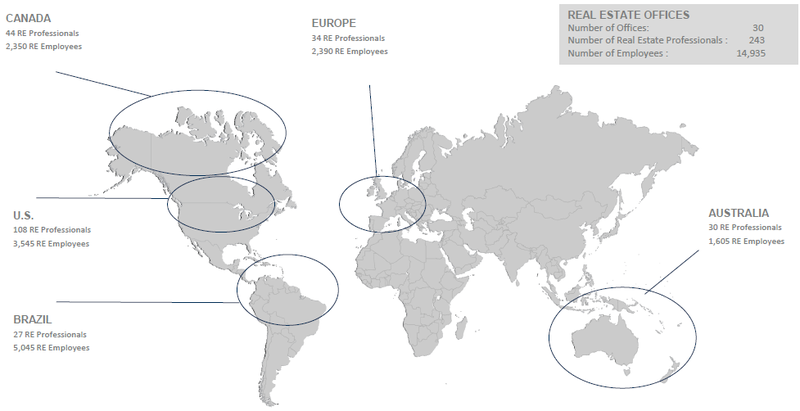 Brookfield’s portfolio is concentrated in some of the worlds most dynamic and established property markets. Brookfield Property breaks the business down into four operating areas: The Office Property section is currently 124 properties of 80 million square feet located in major cities of commerce including New York, London, Toronto, Houston, Los Angeles and Sydney. The Retail Property section includes General Growth Properties one of the top two mall operators in North America and BPY owns a growing mall presence in the emerging economy of Brazil. Multi-family and industrial consist of 15,600 units and 29 million square feet of industrial space in North America. Also owned are other opportunistic assets including 11 million square feet of office and 8 hotels. Brookfield Property Group has over 240 talented and experienced operational, asset management and investment professionals, supported by over 18,000 operational staff located in over 30 locations around the world. Office Properties: Brookfield Property is the owner, developer and manager of premier office properties in the U.S., Canada, Australia and the UK, through a series of public and private vehicles. Brookfield Office Properties (“BPO”) is the flagship publically listed global office company under BPY. It makes up the majority of the office portfolio where BPY has invested capital of $5.2 billion in BPO. In addition, BPY owns office assets around the world directly, and through private funds. The office portfolio consists of 134 office properties totaling (90 million square feet), and 26 office development sites (28 million square feet). The properties are primarily located in the downtown centers of New York, Washington, D.C., Houston, Los Angeles, Toronto, Calgary, Ottawa, Sydney, Melbourne and Perth. Landmark properties include the World Financial Center in Manhattan, Brookfield Place in Toronto, Bank of America Plaza in Los Angeles, Bankers Hall in Calgary, Darling Park in Sydney and City Square in Perth. 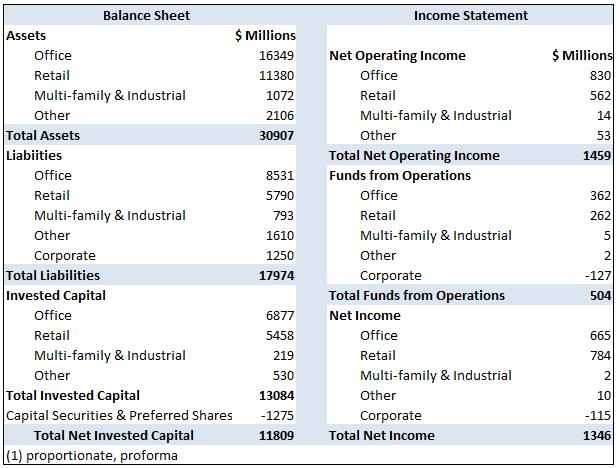 Retail: Brookfield Property owns and manages interests in 182 retail assets in the U.S. and Brazil (160 million square feet) concentrated in the high quality, U.S. based malls of General Growth Properties, Inc. (GGP) with invested capital of $4.7 billion. GGP’s U.S. mall portfolio includes 70 Class A malls generating tenant sales of $635 per square foot. BPY and its investment partners control 41% of GGP and 54% of Rouse Properties, Inc. (RSE), (invested capital of about $300 million). Rouse is a US-based mall company that specializes in the re-development and re-vitalization of Class-B shopping malls with a portfolio of 32 malls (22 million square feet). The company’s Brazil Retail Fund owns shopping centers in Brazil concentrated in urban centers with a dominant position in their respective trade areas. The portfolio includes assets such as the Rio Sul Shopping Center in Rio de Janeiro and Shopping Pátio Paulista and Shopping Pátio Higienópolis in São Paulo. Multifamily: Fairfield Residential (Fairfield) forms the basis of BPY’s multifamily platform in North America. BPY owns approximately 65% of Fairfield. Fairfield is one of the largest vertically-integrated multifamily companies in the U.S. providing a range of services including acquisitions, development, construction, renovation, property management and asset management. As of January 2012, Fairfield was ranked by the National Multi Housing Council (“NMHC”) as the 16th largest apartment manager in the U.S., with over 50,000 apartments under management. 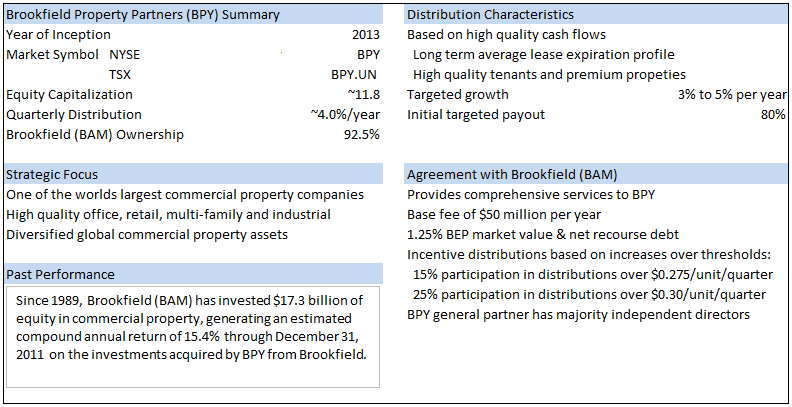 In addition, BPY owns approximately 15,600 multifamily units through its private funds. Industrial: Brookfield Property Partners has a partnership arrangement with Hillwood Industrial Partners for the acquisition of industrial properties in the U.S. Headquartered in Dallas, Texas, Hillwood has a fully-integrated, national platform where it currently owns or manages 30 million sq. ft. of industrial warehouse property and controls over 7,825 acres with 100 million sq. ft. of development potential. BPY also owns an 80% interest in an 18 million square foot industrial portfolio in the southern U.S. and Mexico with a $900 million enterprise value. Institutional investors have long recognized the advantages of real assets like commercial real estate (CRE) in an investment portfolio. Private investors’ interest in CRE is increasing because the volatile equity markets highlight CRE’s advantages of diversification with stable cash flows secured by real assets with appreciating value. For individual investors the barriers to investment in commercial real estate include: large amounts of capital needed; required knowledge of the markets and cycle trends; and operative capabilities. The expertise and financial strength along with the long term focus of a knowledgeable asset manager has historically been a scarcity for “retail” investors. Brookfield Property Partners’ best in class management and a portfolio of first class commercial real estate is now available to the individual investor through ownership of BPY. Superior risk adjusted returns, over time, with lower volatility than other investment sectors. Attractive current income in comparison to other asset classes. Long life, real assets, costly to construct and inelastic demand in large prime markets. Diversification, generally not in synch with investments such as stocks and bonds. Diversification, by sector and geographic operations in North America, Europe, Australia, Brazil. Inflation hedge as property values and rental rates tend to rise with inflation. High quality, high barrier-to-entry markets where space is scarce and development is difficult. Long term stable cash flows from staggered leases and high occupancy. Both rental income and capital appreciation; characteristics of both fixed income and equity. Staggered leases at market-rate rents, well maintained with little deferred maintenance. Active management to increase value through property management, development, acquisition, financing. Superior risk adjusted returns: BPY’s commercial real estate assets tend to be long term holdings and are owned by a financially stable company with a strong balance sheet and a high level of liquidity. As a long term investor Brookfield, although a public traded company, behaves more like a private investor with the capability of weathering the storms and compounding returns over the long term. The table below shows return divided by standard deviation by asset class as a measure of return per unit of risk. Standard deviation is a measure of the statistical volatility of an investment so the table implies statistical volatility is risk. It is not. However since most of the financial industry measures risk this way it is presented here for information purposes. However, return divided by volatility is an indication of the stability or consistency of returns. As a side note, risk is the permanent loss of capital (or the permanent loss of purchasing power) not the daily fluctuation of a share price. Perhaps the return divided by statistical volatility above better describes “Return per Unit of Investor Nervousness or Emotions”. Diversification: The diversity across geographies and property sectors reduces earnings volatility and provides access to a broader universe of investment opportunities. Strong Financial Profile: BPY has $12 billion of net invested capital in the commercial properties and consolidated debt-to-capitalization of about 50%. Acquire assets for value directly through Brookfield sponsored funds or through significant positions in public entities. Enable shareholders to participate in Brookfield’s strategic real estate transactions so far only available to large institutional clients (prior transactions include General Growth Properties, Canary Wharf and Olympia & York). Leverage Brookfield’s global reach, platforms, relationships and restructuring capabilities to access deal flow. Select development on proper risk adjusted reward basis to add growth. Leverage operating platforms’ full service capabilities to add value at every step of the real estate cycle (e.g. underwriting, financing, leasing, asset management, risk management, etc.). Organic growth within existing investments and businesses through value creation strategies and leasing. “Built-in” growth from below market rents and contractual increases on leases. Select redevelopment to add value. Significant influence on public company investments provide scale, reliable recurring income and base from which to grow. 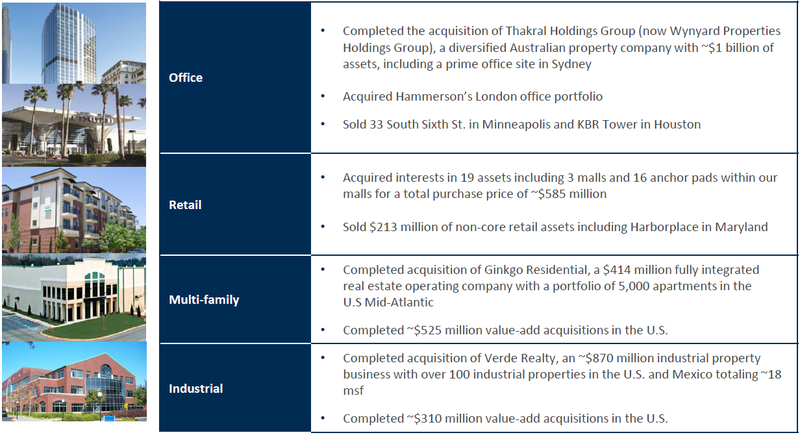 Brookfield Property Partners goal has not changed from Brookfield Asset Management’s long standing and clearly stated goal of a 12%-15% target total return [Source]. As prospective investors we ask; have they delivered on these objectives historically? As a newly consolidated entity we have to rely on the past performance of the components now making up the BPY. During the financial crises and subsequent recession when many companies struggled, some just to survive, Brookfield used its strong balance sheet, financial stability, disciplined and value oriented approach to capture once in a generation investment opportunities for shareholders. Over the past six years, Brookfield has deployed on average $2.6 billion annually to real estate transactions and completed 217 property dispositions totaling ~$7.6 billion. 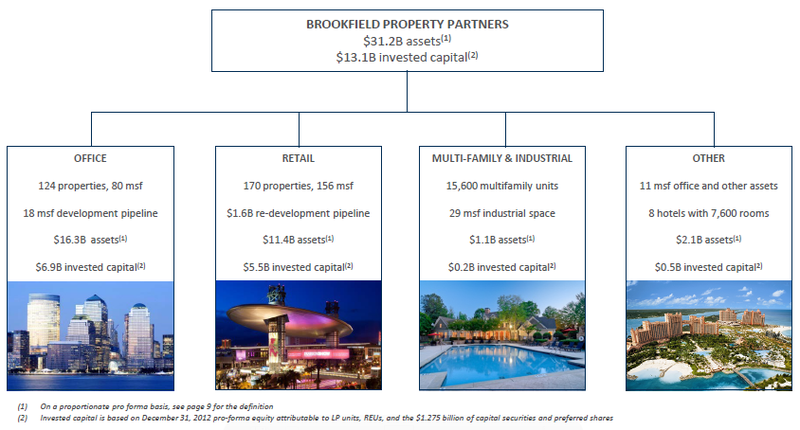 Since 1989, Brookfield Asset Management invested approximately $17.3 billion of equity in commercial property, generating an estimated compound annual return of approximately 15.4% through December 31, 2011. The return represents the composite levered investment return from all of the opportunistic and core entities and investments that was acquired by BPY from Brookfield Asset Management through December 31, 2011. Not surprisingly with returns like these assets under management have increased showing a 12% annual growth rate from $6 billion in 1989 to $86 billion in 2012. Although past performance does not guaranty the future; the historic performance and momentum are very encouraging. As in Brookfield Asset Management’s (BAM’s) other spun off entities, the executive management team, successful at Brookfield Asset Management, is the team supporting and leading Brookfield Property Partners going forward. 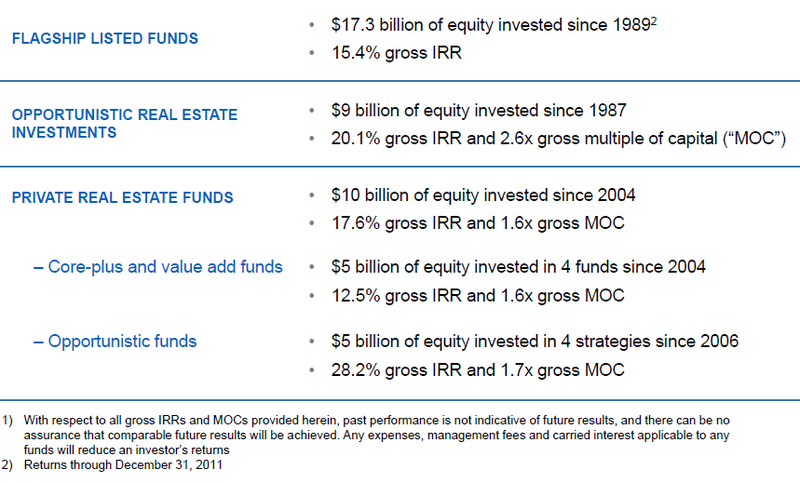 At BAM they produced compounded annual returns of 19% over the past 20 years. BPY’s Chief Executive Officer, Ric Clark, for example has over 30 years of real estate experience and has been employed by Brookfield Asset Management and its predecessors since 1984 in roles including President of Brookfield Office Properties’ U.S. Commercial Operations. Investors in an MLP buy units of the partnership rather than shares of the stock thus the term “unit holders” and payments to the unit holders are referred to as “distributions” rather than dividends. There are two levels of MLP ownership, the general partners and the limited partners. The general partner, in BPY’s case is Brookfield Asset Management. BAM as general partner manages the operations and all services including management are provided by the general partner. The publicly traded limited partner (BPY) pays the general partner (BAM) for the services provided through an agreed to fee structure and performance incentives. The limited partner units are publicly traded and the general partner units are not. Alignment of Interests: The general partner BAM is paid an incentive to increase distributions to the limited partners. BAM collects a 15% distribution incentive then a 25% incentive after certain distribution levels are reached. This Incentive Distribution Right (IDR) gives the general partner an incentive to increase limited partner distributions. The general partner can also own limited partner units as is the case with BAM owning initially 97.5% of BPY’s limited partner units aligning BAM’s interest with unit holders in BPY. It is also then in the general partner’s interest to increase distributions since they also receive the distributions through direct ownership as well. BAM as a general partner is also paid 1.25% of market capitalization of the limited partner, above the initial market capitalization of about $11.8 billion in BPY’s case, as an incentive to work to increase the market value of the limited partner’s units. Favorable Tax Treatment: Shareholders in a corporation pay double taxation, first at the corporate level then at the personal level when dividends are received. Partnership owners are taxed only once, when they receive distributions. Reinvestment of Cash Flow: Since there is no partnership equivalent of corporate income tax funds from operations, not paid out as distributions, can be reinvested in the business on a pretax basis. This provides for tax free compounded returns (capital gains) where reinvestment opportunities exist with suitable returns. Lower Cost of Capital: Without the equivalent of corporate income tax MLPs typically enjoy a lower cost of capital than a taxed corporation. Benjamin Graham, considered the “Father of Value Investing” argued businesses should be purchased below their current intrinsic value to provide a “margin of safety” with little or no regard for future growth. This creates a dilemma however with companies, perhaps not selling at sufficient discounts to current intrinsic value, but with increasing intrinsic value as is occurring with BPY. One solution is to consider future growth but not to pay for it by treating growth as (part of) the margin of safety. Brookfield Property Partners is clearly growing, so we’ll use the target growth which historically has been achieved, as part of our margin of safety. This view is important with companies like BAM/BPY that operate with long term growth strategies or as value investors we may forever be locked out of great investments and income streams. Management’s total return target of 12%–15% per share is the sum of yield (distributions) and capital appreciation. An underlying premise in our valuation is that these returns can only be achieved where there are comparable increases in cash flow through operations improvement, organic growth, acquisition growth, capital reallocation or improving business conditions. A second premise is the capital structure of the company remains relatively constant over time. Management’s job is to decide how best to utilize the excess cash generated in the business. They can either reinvest it in the business, if opportunities exist to do so at sufficient returns, or return it to shareholders as distributions (or share repurchases). If investment opportunities exist to generate 12-15% returns in this low (near zero percent) rate environment, my vote will always be to maximize reinvestment. Two cases are evaluated: Case I assumes funds from operation (cash flow) grow at the low target range of 12%/year and in Case II at the upper end of the range, 15%year. 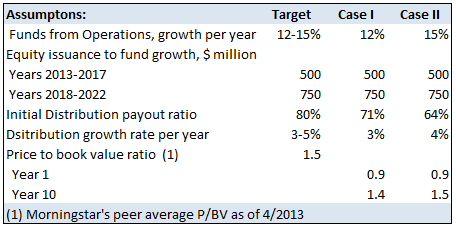 Consistent with BPY’s business plan presentation the other assumptions are outlined in the table below. One additional assumption we added is that the price to book value multiple will increase to the current Morningstar’s peer group average as the market increasingly recognizes BPY’s above average performance and the (undeserved) discount to average is eliminated. Fees and incentive payments to Brookfield Asset Management are per existing agreements noted in the “Summary” table below and will be discussed further in the BAM valuation later. The five and ten year outlook for Case I and Case II are below. These estimates along with associated management and incentive payments to BAM will be included in the BAM valuation. Attractive returns are anticipated over the next 5 and 10 years if management continues to meet their targets as they have done. BPY provides a sufficient margin of safety in my view to consider investment now. It should be noted that these are just two of many possible outcomes. There are many cases that could be analyzed; however, it is believed that this approach yields a reasonable estimate given the inputs. It is better to be approximately right rather than precisely wrong. Property Type: These sector classifications typically include office, industrial, retail, apartment, hotel, senior housing… Limits are generally placed on each property type with the first four main property types usually having a higher limit. Geography: This is an area that may require some classification. There may be a need to dissect first by overall region…It is important to note that by investing abroad investors will then need to also understand, determine and monitor any potential currency hedging policies and country risk. Risk Classification: … widely used industry parlance has been Core, Value-Added and Opportunistic. Again, limits are put in place in the investment policy on the tolerance for each of the respective risk classifications. Life Cycle: This generally covers the nature or state of the asset which may fluctuate but typically includes stabilized, lease-up, redevelopment, predevelopment, development and other. Investment Structure: This would cover the structure or vehicle in which your investment may be held. Sometimes called the real estate quadrant, it would include public equity, private equity, public debt, and private debt. Manager: The last area to monitor includes any firm exposure an investor may face. A limit may be placed on how much can be invested with a single investment manager. The primary offsetting factors to consider is Brookfield Property Partners has decades of commercial real estate experience on a global basis with an outstanding track record. So the “manager risk” in this case becomes a strength, and as investors we can look to BPY’s managers to mitigate these other risks. This management team is sought out by institutional and professional investors and it would be very difficult to find a comparable team available to the individual investor. As we describe on the outset, the executive team at Brookfield Property Partners and Brookfield Asset Management consists of 16 senior managing partners led by Bruce Flatt appointed CEO in 2002. This team has been consistently outstanding over the years. They produced compounded annual stock returns of 19% over the past 20 years. They communicate openly and honestly with shareholders. Senior managing partners and the Board of Directors own Partners Ltd., a private company that holds about 20% of Brookfield’s shares, closely aligning management’s interests with the shareholders. Interest Rate Risk: MLP units are often viewed as income investments and can trade somewhat like bonds, rising when interest rates fall and vice versa. We are likely facing higher interest rates in the future. BPY also uses debt to finance its business so a rise in interest rates will, all else equal, decreases returns. Offsetting the interest rate risk to some degree is BPY’s ongoing growth and financial strength enabling its current strategy of refinancing debt at record low interest rates and lengthening terms. Further, increasing interest rates tend to occur in improving economic environments where business activity tends to increase and improve cash flows. Brookfield Properties as a listed entity is less than one week old. Yet it feels like an old friend because in reality it’s been around and in the making for decades. The company, management, capabilities and track record are known worldwide by some of the world most sophisticated investors. With a 23 year history of creating total returns of 15.4%/year and asset under management growth of 12%/year we can now enjoy getting paid with distribution of about 4%/year while we watch the growth continue. These levels of returns will not continue forever, however here too it is hard not to be optimistic. The past performance and accomplishments through some of the most tumultuous markets in a lifetime suggests opportunities can be generated with their contrarian investment style under the most trying circumstances. The stable cash flows from a unique portfolio of best in class office and retail real estate and a growing multi-family and industrial sector should make cash distributions on the units predictable and growing as a slow economic recovery continues. BPY appears well positioned for the future and will likely be a significant growth platform for Brookfield Asset Management and an outstanding income and growth investment in itself. Up in the next post, Brookfield Capital Partners. Note: Subsequent to original posting certain tables in this analysis were corrected. I am long BPY as well and not too pleased with the price action as of late, by my calculation it is trading at 0.87 book value of its underlying components (GGP, BPO, RSE) even after the REIT related sell-off and yielding closer to 4.5% . On top of that, a hedge fund has called it a Ponzi scheme as the distributions from the components will not be enough to pay for the yield. I was just curious what your thoughts are on that point? Thanks very much and great writeup!